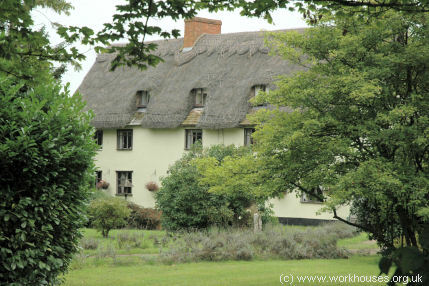 In 1779, the Suffolk Hundreds of Hartismere, Hoxne and Thredling were incorporated under a local Act of Parliament for the better Relief and Employment of the Poor, within the several Hundreds of Hartsmere, Hoxne, and Thredling, in the County of Suffolk (19 Geo.3 c.13). However, the incorporation never raised the £16,000 required for the erection of a house of industry, and the incorporation was never carried into effect. Several member parishes did operate workhouses of their own, however. 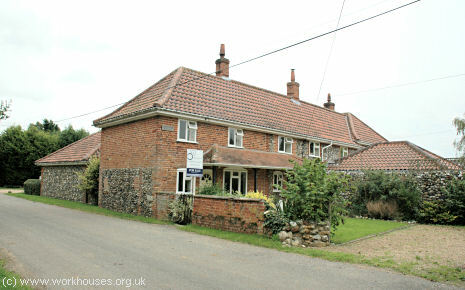 In Fressingfield, a house on Low Road was once used as the parish workhouse. Badingham had a workhouse on Mill Road. Buildings still survive known as the Old Workhouse and Workhouse Cottages. 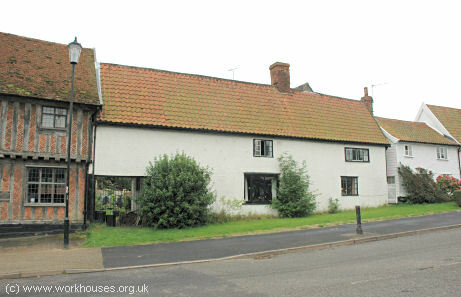 The old Guildhall in Worlingworth, which dates from around 1500, once served as the parish workhouse. At Laxfield, a workhouse once operated in a building now known as the Old Bakery. County of Suffolk: Athelington, Badingham (2), Bedfield, Bedingfield, Brundish, Denham, Dennington (2), Fressingfield (3), Horham, Hoxne (2), Laxfield (2), Mendham, Metfield (2), Monk Soham, Saxstead, Southolt, Stradbroke (3), Syleham, Tannington, Weybred [Weybread] (2), Wilby (2), Wingfield, Withersdale, Worlingworth (2). The population falling within the Union at the 1831 census had been 15,166 with parishes ranging in size from from Athelington (population 129) to Stradbroke (1,527). The average annual poor-rate expenditure for the period 1833-35 had been £19,904 or £1.6s.3d. per head of the population. 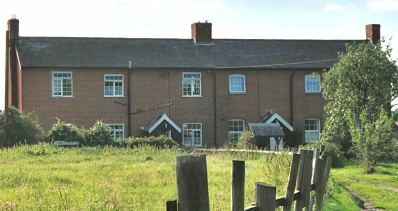 A new Hoxne Union workhouse was built in 1835 at Barley Green near Stradbroke and was based on the popular cruciform plan. The Poor Law Commissioners authorised an expenditure of £8,274 on construction of the building which was to accommodate 300 inmates. The workhouse location and layout are shown on the 1886 map below. The workhouse was closed in 1871 and seems to have stood empty for many years. It was used as a prisoner of war camp during the First World War but the main building appears to have been demolished by the early 1920s. The single-storey entrance ranges and the fever block at the rear survive, having been converted to residential use. Hoxne entrance range from the south, 2001. Hoxne fever block from the east, 2001. 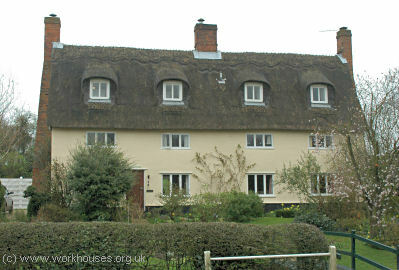 In 1907, the Hoxne Union was merged with the neighbouring Hartismere Union to form a new Hartismere and Hoxne Union. Suffolk Record Office, Gatacre Road, Ipswich IP1 2LQ. Very few local records survive — holdings include: Guardians' minute books (1905-08); etc.